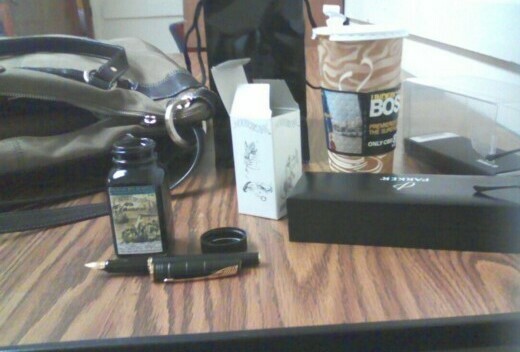 Around 8:50 am, waiting to check in for jury duty: large coffee, bottle of Noodler's Old Manhattan Blackest Black Eternal ink exclusive to the Fountain Pen Hospital, and in the foreground my new Parker Latitude medium nib fountain pen. Will be on jury duty for a few days, and I actually won't mind it for one reason: the courthouse is a 15 minute walk from the Fountain Pen Hospital. I'll be spending my lunch hour there, and hopefully that's all I'll be spending there! Lately I've gotten into watching Top Gear on BBC America. This has got to be one of the funniest shows I've ever seen. So here's the Top Gear Polar Special. From the 4:30 mark to about 12:30 are 8 of the most hysterical minutes of television I've ever seen (especially the plunge into the icy water around 9:30). Update 8:54 am: the Fountain Pen Hospital opens at 7:45 am, and I just found out they are having a great sale on select pens. 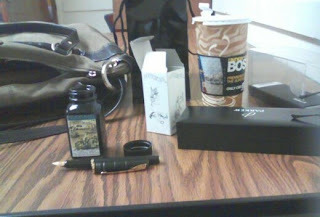 Somehow, a Pelikan Technicx medium nib and a Parker Latitude have made their way with me to jury duty. We also had a long discussion about Iroshizuku ink, and one of the guys said I reminded him of Sue Ann Langdon. I had heard about the Uni-Ball Fusion rollerball, that the colored ink in the barrel turned black on the paper and that sounded like a great idea to try. So I was happy to see them at Paper Access on W. 18th street, and picked up one in Ruby. 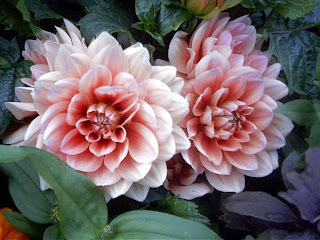 I loved the barrel color and the faintly pinkish colored ink. This would be fun, I thought. Looks like I purchased the dud of the group, or else there is a "use by" date for the ink and mine is old and stale. Which is a shame, as I really do like this pen. The ink flows smoothly and the writing, if you can see it, is clean and clear (perhaps a little too clear in this picture, almost see-through). If you've used the Uni-Ball Fusion and had good results, I'd like to hear about that. I did want this to work, but I think I'll skip trying any more. It's a cute fad, but I want to be able to see what I write--which may be setting the bar a tad too high for the Uni-Ball Fusion. 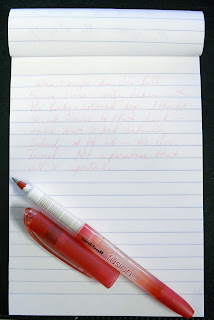 I stopped by Muji this past weekend to look for some supplies, and saw this retractable gel ink pen. I have several Muji RTs, but it was the color of this one that caught my eye: a medium blue-gray/steel blue that looked quite inviting. There was another color I hadn't seen before as well, so I bought both and went on my way (the other will be posted later this week, as I haven't tried that one out yet). Muji pens are fantastic and inexpensive, and there are now some interesting colors beyond the standard blue-black-green-red to choose from. 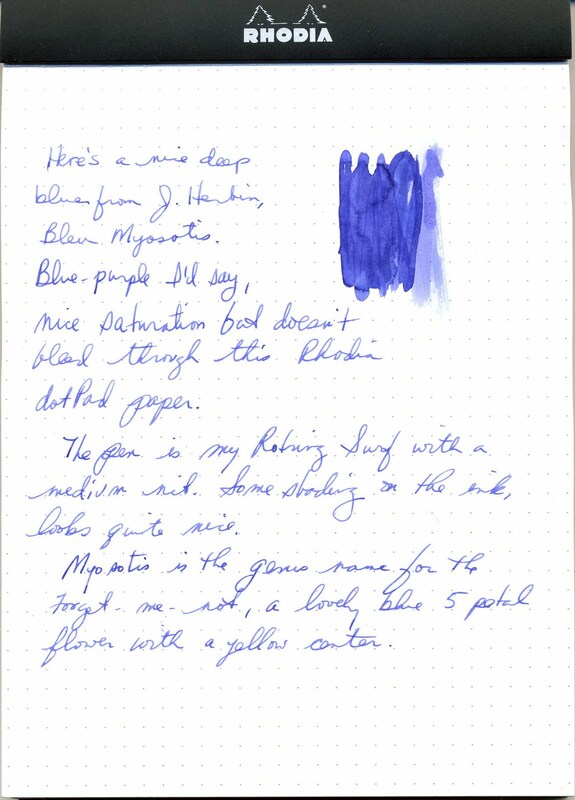 This steel blue comes in0.38mm only, or at least only at the one Muji I went to on W. 19th Street. For $1.50 I am inclined to buy several with this color and some other refill colors and just swap out the steel-blue when I need to change. The point is sharp, which makes the line crisp and thin. And the steel-blue color complements the Doane Paper I used for my try out, rather than fading it out and making the writing hard to decipher (a problem I've had with some thin line pens). All in all, a definite keeper. If you are near a Muji, check this pen and color out. One of my past JetPens.com orders included a Kuretake Bimoji Felt Tip Brush Pen with a super fine tip, and I've finally gotten around to using it a bit more. It certainly looks like a traditional brush pen with a faux wood body and a felt tip that mimics animal hair. If you need something for fine writing, this would be a great choice. I bought it because I was intrigued by the pen and liked the idea of writing with it--the semi-soft rubber grip eases any tension in the fingers and the line width can be changed from fine to medium by increasing or decreasing the angle of the pen. 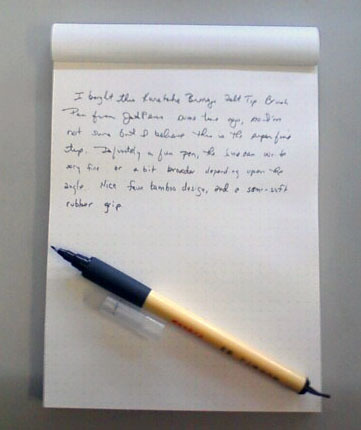 The pen writes smoothly on this Rhodia dotPad paper, and no bleed through or shadow so double-sided writing is fine. One complaint is that the plastic cap doesn't fit on the end of the barrel, and may be lost. Otherwise, it's a nice felt tip pen that writes well. 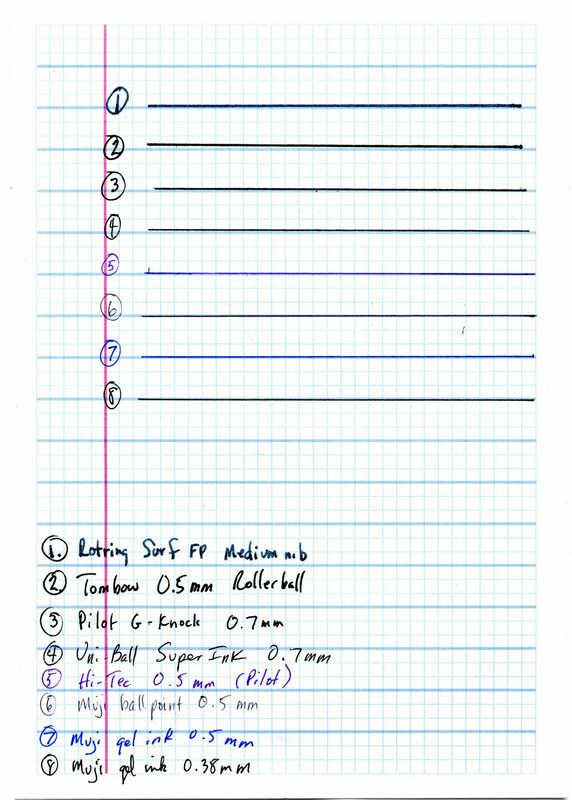 You may not need something quite so stylized, but it's something to consider when putting together a JetPens order. Looking around the Art Brown website I came upon this Lamy Al-Star in Coffee Brown in the new Coffee Brown color. Definitely putting this on my wish list, they are available in May and I would imagine will be in stock for the Spring pen fair in (Wednesday, May 12 to Friday, May 14 from 9:30 to 5 pm). There's a rollerball as well, and a ballpoint--I don't remember looking at the Lamy ballpens as I only had eyes for the fountain pen and rollerballs so seeing it will be interesting. Especially if it will accept a gel ink refill, which I've done used my Rotring 900 and Faber-Castell ballpens. 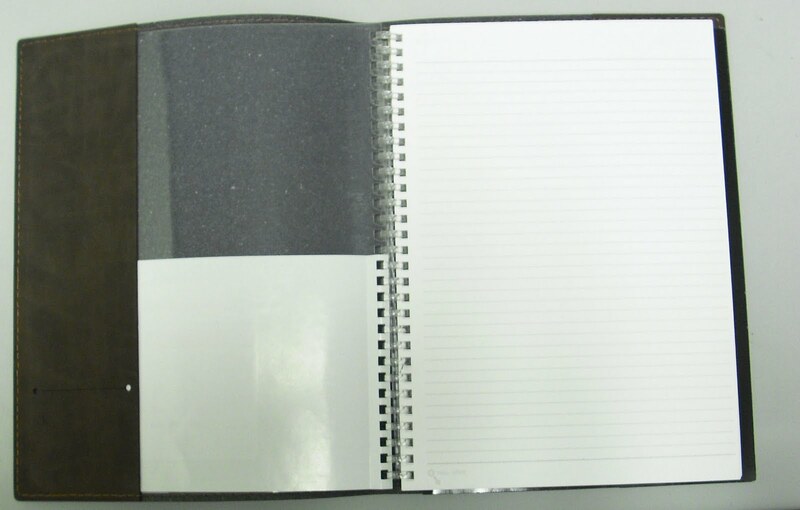 I recently purchased an Exacompta Basics silver edged journal with a dark green faux-calfskin Madeira cover (which really does have a leather-like feel to it). I wanted the paper journal and got the cover at a discount, so it worked out well for both parties. I've been meaning to sample the 100g off-white paper that is great for fountain pen use. But as I've already started some other journals for different purposes, what do I do with this one? I'd write the Great American Novel, but then I'd have to figure out what that was exactly. And it would have to be this America and not some Alt-America, so no vampires, werewolves, pixies, or witches. Which leads me ponder The Great Gatsby as a zombie love story--except that aren't zombies by their nature second acts? Could they drive a car? And wouldn't it be "East Brain" rather than Egg? 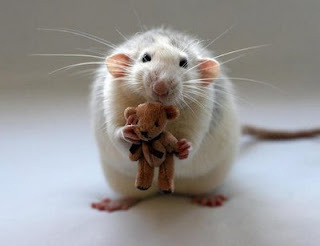 Some days I have a hard time focusing--is it noticeable? Back to paper. 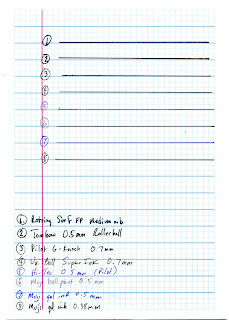 The journal is a Basic that measures 5.5 by 8.25 and is lined. Now that I look closer, the lines are a lot wider than I've seen in other journals, mostly the Japanese ones I've been using lately and I'm thinking I can get out my Rotring 900 broad cursive italic and have a lot of fun letting the wide nib go where it wants. Another thing I like about this journal is the multi-colored ribbon, not black but red, gold, and green. Karma chameleon, anyone? 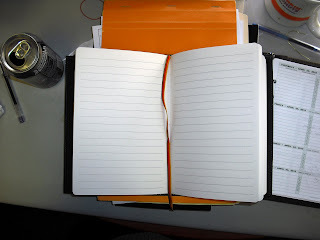 (Underneath the journal is one of my favorite Rhodia notepads, the yellow lined and stapled No. 19.) Journals and notebooks/pads everywhere, we'll have to have a giveaway soon. Some time back, when I was making one of my first fountain pen ink purchases and didn't feel comfortable buying a bottle, I decided to buy some cartridges. The only two choices were Private Reserve and J. Herbin, and as I recognized the latter I decided to buy one of the cute round tins of cartouches. As I also wasn't comfortable with all the colors, I decided to stick to something I know: plain, dependable blue. But which one? 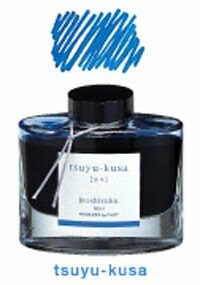 Fortunately there were only a few really dark blues, and I chose Bleu Mysotis--which I later learned is the blue forget-me-not flower that adorns the package and bottle. When I was swabbing the color I thought I detected some purple in the blue, but now that I've had time to look at it I'm not sure. It's a deep blue, but I wouldn't call it warm. It seems to be a touch on the cooler side. There's some definite shading and nice saturation without any bleed through on the Rhodia dotPad. I'll have to gather up all my blues and swatch them to get a better sense of where Myosotis fits in, but right now it looks like an all-purpose, dependable blue. Unfortunately the picture of the closed padfolio didn't turn out too well, and I'm not able to take another one. But you get the idea of the color (which looks a touch green in this snap) as well as the way it handles a ring notebook. 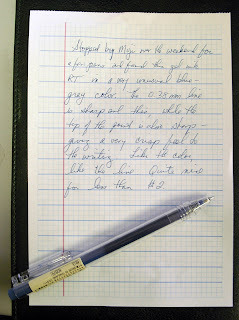 Zuzu had an interesting question about the Uni-Ball Super Ink 0.7mm pen reviewed below, whether the line seemed thinner--more like a 0.5mm. So I grabbed a few different pens, some gel ink, some ballpoint, and one of my fountain pens, and ran some lines to take a look. On the paper (with my nose pressed up to the pad of Doane grid + lines), the thinnest lines look like 5 and 8, the Hi-Tec needle point and Muji gel ink 0.38mm respectively. The two widest seem to be 1 and 2, the Rotring medium nib and the Tombow 0.5mm rollerball. The Uni-Ball Super Ink (4) looks similar to 5, 6, 7, 8. Now I'm thinking I need to pull out a few 1.0mm pens to really get a look at them. But from what I can see in the pic, line width is definitely varied among different manufacturers even when they are all supposedly the same size point. Comments are definitely welcome. At 14th Street just east of Third Avenue is an empty lot that extends all the way to 13th Street. In the summer it's filled with wild strawberry plants, and ususally you just pass by on the way to the Dunkin Donuts or KFC down the block. But some wag decided to comment on the sub-prime/housing/financial crisis that we've all been living through the past 2-3 years by "building" the East Village Estates, a series of housing units for the neighborhood's furry friends. Who, when you think about it, have as much income as some past NINJA (no income, no job, no assets) home buyers. And no, the economic mess we're seeing wasn't necessarily (all) their fault. One of my favorite fountain pens is this Lamy Al-Star, which has two things that make it special to me: the Raspberry color that makes it distinctive, and the Extra Fine nib. I'm also a fan of the aluminum body and the lightweight feel of the pen. This Raspberry Al-Star was purchased at last October's NYC Pen Show from Swisher Pens (which may be why I've never seen this particular color in NYC, either at Art Brown or any of the other stores that handle Lamy pens). I had a great time trying out all the different nibs. Extra Fine was my favorite--I'm just not a fan of broad nibs, although I'll be the first to admit I've never given then a fair chance. Coupled with the Rhodia dotPad this makes a fantastic #dailyaresenal. Let's face it, unless a ballpoint or gel pen leaks ink all over my hand I tend to like writing with it. I'm not as fastidious as I am with a fountain pen (Japanese fine point preferred except with Lamy, where I like an XF point, slim style, no or very little frou-frou). So the Uni-Ball Super Ink gel ink pen is just a very nice pen that writes well. That I got it as a freebie during Uni-Ball's Twitter giveaway week(s) was icing on the cake. The Super Ink has a thinner line than I would have expected from a 0.7mm; the rubberized barrel makes gripping the pen less stressful on the fingers. And according to the literature, the large pigment particles in the ink form an unbreakable bond with paper fibers, so this prevents check and document fraud. That alone makes it an interesting pen--there is something about the way the ink looks on the paper that is different to me, a shine that I haven't noticed in other inks. Could be the pigment particles, could be my needing new glasses. But if you get a chance to try it, do by all means. 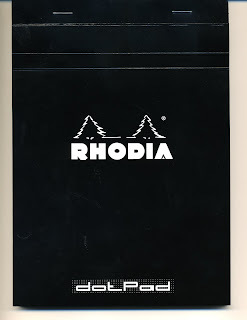 Many thanks to Karen Doherty, Vice President of Marketing at Exaclair, Inc. for sending me this Rhodia dotPad as soon as they landed in the US. It's my favorite size, No. 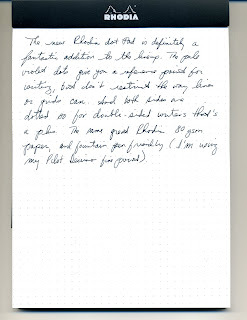 16 (5.8 x 8.3), and the dotted writing pad is fast on its way to becoming my mainstay Rhodia pad. 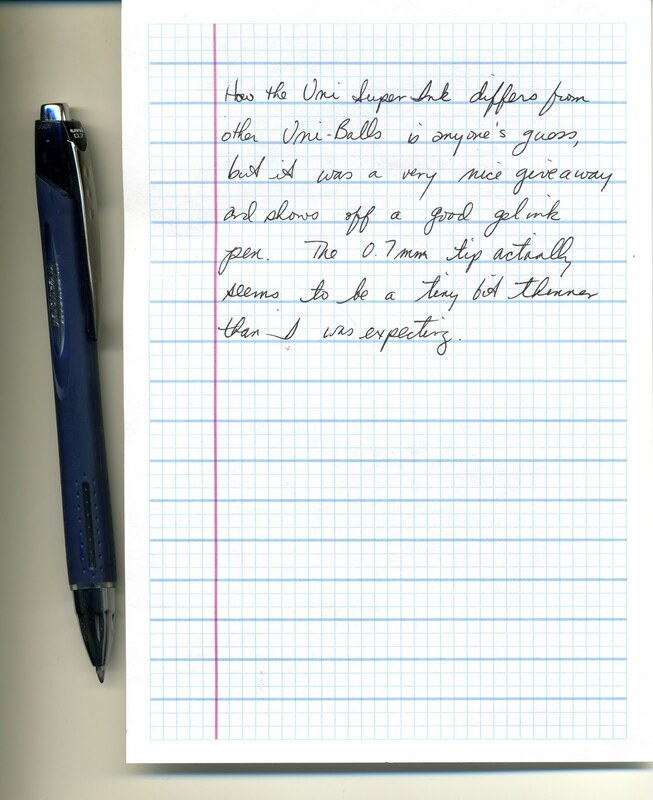 The pale violet dots give just the right amount of visual cues for straight-line writing, but aren't busy or obstructive like lines or grids (pace Doane Paper which I love but can find a tad overwhelming). The pages are the wonderful Rhodia 80gsm white stock, with dots on each side for double-sided users. I tried my new dotPad out using my Pilot Decimo fine point fountain pen, which left a shadow on the other side of the paper but didn't bleed through. 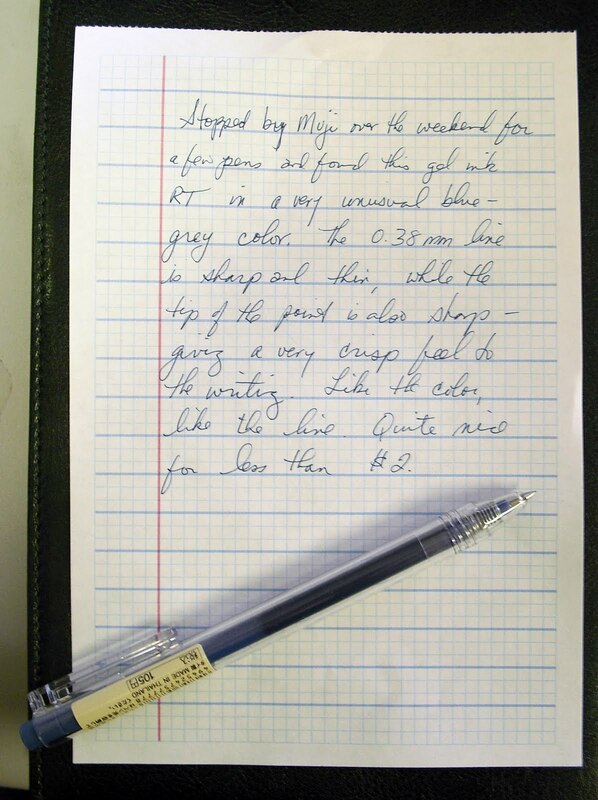 Writing using the dots as a guide is great, I like the free flow of pen on paper. 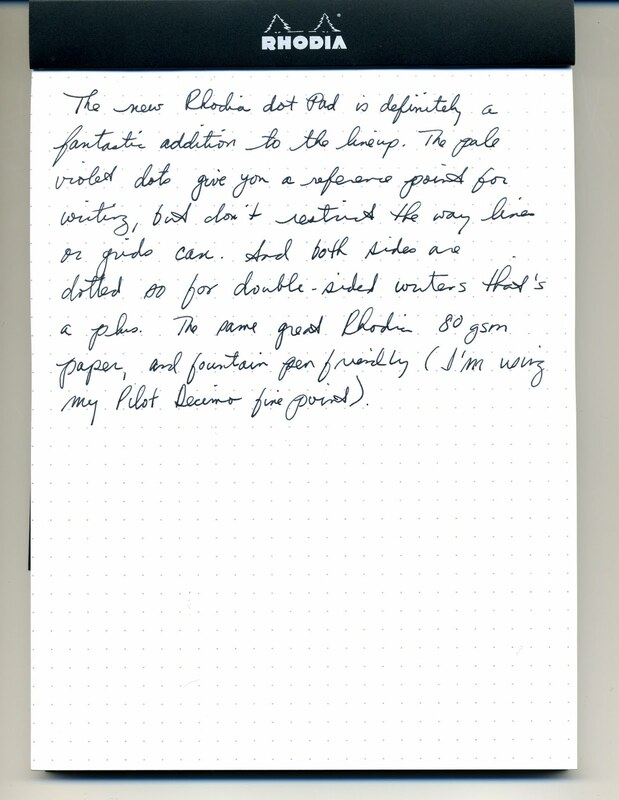 The dotPad has a new color scheme as well, it's definitely not your father's Rhodia pad. The white pine trees and white "mod" lettering give this pad a more serious look. I love orange and black (especially at Halloween), but there are times I'm in the mood for something different. 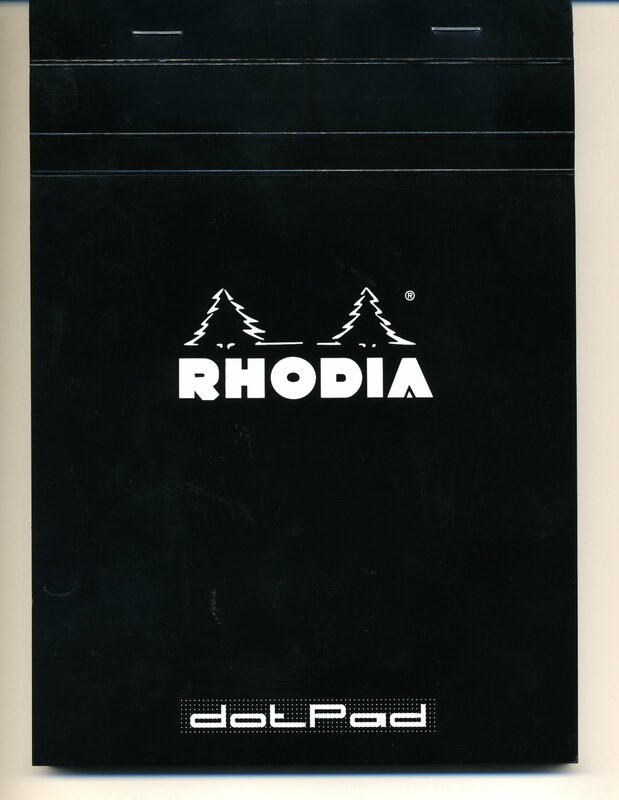 The dotPad is definitely different, and a fantastic addition to the Rhodia lineup. I'm looking forward to seeing this in a larger size and can't wait for the rest of the lineup to get here. Decided to take a short break and enjoy the weather and some knitting. April is here, time to come out of hibernation.